With not one but two top, top clubs on his CV the hype machine went into overdrive with ol’ Davide. Which makes him all the more disappointing. Unlike some, he’s not been a disaster, but then again it’s pretty hard to see why he’s had such storied employers to date. Belkalem’s a tank, Merkel’s got a bit of it and you can even see how someone might see Fabbrini’s preening dilettantism and conjure up the idea of potential. Way down in the depths. They might not live up to it, but they all have one discernible quality that could hold the seed of footballing goodness. But Faraoni’s just really… ordinary. He’s capable of good stuff, and has shown once or twice over the course of the season that he can have a decent turn of pace, but invite an unclued-up friend to a game – or go and sit in the Upper Rous – and he would peg him as typical Championship fodder. If it wasn’t for his horrible mullet. But he’s alright. He lets his man go a bit too often and he doesn’t offer much at all going forward barring the odd thunderbastard, but he does a job at wing-back. In the last part of this never-ending round-up I mentioned how hard it is to judge players personalities based on their on-pitch personas. With Faraoni it’s hard to look past his haircut. But one can’t shake the feeling that he hates every moment he pulls on a yellow shirt. He spends most of his time trotting up and down the wing looking like he’s just gone outside his mum’s house to find a huge dink in his Vespa. And that, apparently, is nonsense. I’ve heard reports that he is in fact a delightful bloke, and has been known to partake in kick-abouts with fans in his local parks. Perhaps his cloudy disposition is part of the reason one finds it so hard to warm to him. Daniel Pudil, stationed in his mirror position, shares Faraoni’s liking of letting his man get his cross in, and puts in a good cross once every three or four attempts, but because he wears his heart on his sleeve what with the bi-weekly parading of his son and season ticket to Top Golf, he managed to get on my Player of the Season ballot. It wouldn’t surprise me if the Pharoah was found in some Italian yo-yo club’s squad come August – we could probably get a significant fee from a club similarly enraptured by his pedigree – but if he did end up returning, it wouldn’t be the worst thing in the world, even if he is more Shepshekaf than Khafra. Lol. It’s probably a bit contrived to call Uche one of the season’s success stories, but after a season that produced little in the way of good cheer where the Nigerian is now compared to where he was at the turn of the year is surely a cause for optimism. Because Uche signed his pro terms coming from another club, there was probably more expectation on him this season than was warranted. Fans were asking questions when he hadn’t been involved by October, and when we were going through the worst of form in December it became a matter of some consternation. The same wouldn’t have happened for Luke O’Nien, and won’t happen for Josh Doherty and George Byers next year, but as he’d been actively recruited from Reading (with an undisclosed fee being decided by tribunal in January), the then 18 year old was expected to feature. In fact, he was only named on the bench for two cup ties and failed to even get on the pitch before he left for League One Crewe in January. There were suggestions that Uche, who’s pretty bloody big, wasn’t as developed technically as he was physically, but the fact he found himself temporarily in the third tier, while his Watford-grown contemporary Bernard Mensah had to dip into Conference football suggests that he is well thought of in personnel circles. He had a slow start at Gresty Road, which Alex boss Steve Davis put down to his terrible conditioning. After a rigorous training programme, however, he managed to cement himself as a first team regular, starting all of the side’s last eight matches as they escaped relegation by the skin of their teeth. During this period, the teenager bagged two important goals to go with a brace in one of his first games in February. It may not seem like much, but in these big games for the club, Uche also provided a number of assists for strike partner Mathias Pogba. Now, a few months after the club openly considered sending him back to Watford, he is returning as something of a favourite amongst Alex fans. He may not be ready to take up a first team place, but he could be useful – especially as a home-grown player – in the upcoming campaign, while it looks like Mensah will go out again higher up the pyramid once he’s recovered from the knee injury that prematurely ended his season. Absence and hindsight may have made me fonder of Iriney. He looked rubbish in a team that started off well, and then lost his place in the side just in time for us to collapse into ineptitude. We only lost three of the twelve games (25%) in which he started, and thirteen of the thirty four in which he didn’t (38%). Now, I don’t for a minute think that this was actually anything to do with him. Touted as a grizzled veteran to play the defensive midfielder role – combining Eustace and Hogg into one – he was in fact a slow and haphazard codger too used to the methodical football of Spain and not ready for the whirlwind of the Championship. Common was the sight of the Brazilian arriving at the position of an attacking opponent two seconds after his adversary had vacated it, able only to kick at his heels and concede a needless foul. In fact, it’s the only thing I can remember him doing. So when he returned on loan to his adopted homeland at the end of January, having made only two appearances since November, it was no biggie. Seven starts in three months alongside Alex Geijo for Real Mallorca in the Spanish second tier followed the move. But would he have improved under Beppe Sannino? The reason we became rubbish in mid-September was not so much Iriney’s dropping as Almen Abdi’s crippling injury. With him and Daniel Toszer popping it around midfield for the last few months of the season, was there a place for Iriney to sit there doing nothing much but not feeling forced into helping out the attacking? Could he have been the static shield that negated the need for Mathias Ranegie to commit the foul that allowed QPR back into the game that ended our season? If he was still here, would we, indeed, be planning our second trip to Wembley in twelve months? No. But it’s something worth thinking about. 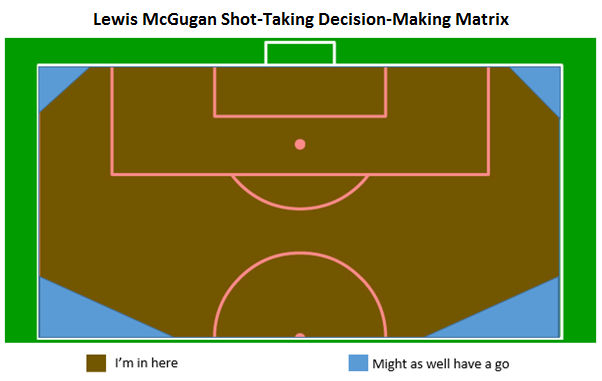 It’s not that Lewis McGugan couldn’t be a good footballer. It’s that he doesn’t seem to want to be one. There have been many a harsh word written about the midfielder on these pages over the past season, but the reason it’s so negative is that he’s frustrating rather than legitimately bad. A ‘Football League Show’ player if ever I saw one, McGugan arrived at Watford rated by everyone but Forest fans, who elicited caveats about his poor work ethic and desire to play for the team. Nonsense, we thought, we’ve seen him play – he scored those really good goals, remember? He does indeed score goals, eleven from midfield is a great return, but I’ll be buggered if he does anything else. Other than try to score goals, of course. That he does. A lot. We saw against QPR that Lewis can be an effective midfielder. The short, directive passing of Daniel Toszer and Almen Abdi virtually forced McGugan into the right spaces, and his one-track mind meant that he took play forward and into dangerous areas. Then he put the ball in the upper tier. Playing with those two next year, if Toszer returns, could develop him into a better player – particularly as it plays to his strengths and gets him closer to the opposition’s goal. But I’m not sure he’ll get the chance. With the dazzling intricacy of the other two taking care of possession, we’ll need a more combative third, and combative he ain’t. The stock of Sean Murray and Cristian Battocchio is always rising and they would be more natural fits, so I reckon we could see McGugan heading for pastures new, with a healthy profit from his summer free transfer to boot. And when he gets wherever he goes – should he go – our warnings will fall on deaf ears. Don’t you remember those good goals he scored? Reblogged this on Nathan Lowndes, Football Genius.